Nozomu Wakai’s DESTINIA Discusses His New Album "Metal Souls"
Joined by Ronnie Romero (Rainbow, Lords Of Black, CoreLeoni), Marco Mendoza (The Dead Daisies) and Tommy Aldridge (Whitesnake), Japanese Heavy Metal Guitarist Nozomu Wakai is set to release the new album “Metal Souls” under his project Nozomu Wakai’s DESTINIA. The new generation Japanese guitar hero Nozomu Wakai blasts his way into the world on board his project Nozomu Wakai’s DESTINIA, with music composed/ written/produced by Nozomu himself. Nozomu Wakai has previously released two albums, “Requiem For A Scream”(2014) and “Anecdote Of The Queens”(2015), by the project Nozomu Wakai’s DESTINIA. 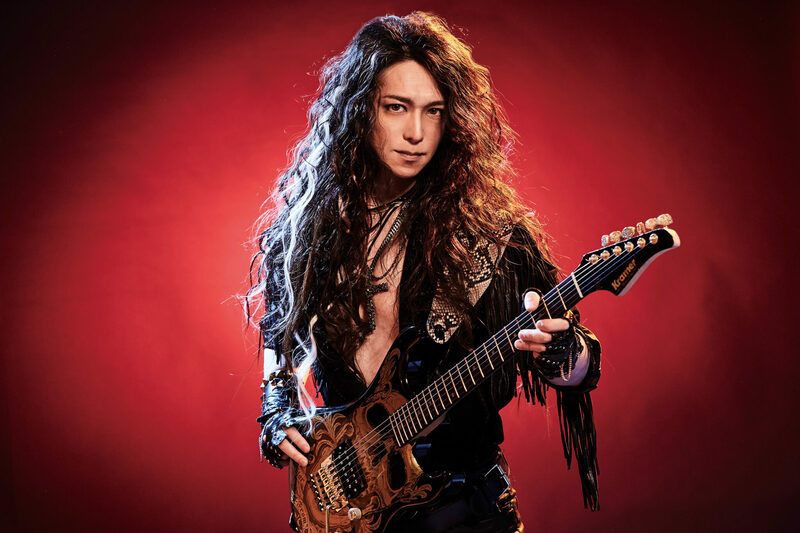 He has been recognized in the Japanese hard rock and heavy metal scene for his contributions on guitar/ compositions/sound directions to releases by the country’s leading musicians and anime’s. In 2016, during a quest for new musical directions, Nozomu witnessed a stage performance by Lords Of Black, featuring vocalist Ronnie Romero, at Loud Park 16, the world-famous metal festival in Japan. Though Nozomu was well aware of Ronnie’s abilities, he was hit hard by the new Ritchie Blackmore’s Rainbow singer’s live talent. A direct offer was made, and it was decided that Ronnie would join Nozomu and participate as the vocalist in his project. Having set his musical course for the new compositions, Nozomu made the decision to offer Marco Mendoza, bassist from The Dead Daisies and solo musician, and Tommy Aldridge from Whitesnake, the rhythm section duties to add extra strength to the music. It was an obvious choice for Nozomu’s music, demanding the presence of two musicians with vast knowledge of the history of hard rock and heavy metal. Upon listening to Nozomu’s music, Marco and Tommy were thrilled to get involved. Nozomu’s enthusiasm towards authentic metal with all his heart and soul is apparent from the album’s title track “Metal Souls”. The emotional guitars and soulful vocals complement each other, backed by the powerful grooves of Tommy Aldridge and Marco Mendoza, the impenetrable rhythm section who has been a huge part of the history of hard rock and heavy metal. Where you self-taught or had a teacher? NW: I took some guitar classes, but it didn’t last long. The best teacher for me is all the HR/HM music from all over the world. I listened to a myriad of CDs and I was particularly interested in the history, background and the way of thinking of bands and musicians. Learning the history of HR/HM made me who I am as a guitarist. I toured with local bands and also I was able to work with professional session musicians when I was a teenager, and those are great learning experiences for me. NW: As for every album, the first important thing is to have a vocalist. Then I try to imagine the concept and the songs I want to write. After I have concrete ideas, all completed parts come up to my head. Sometimes it is like a picture or music from a radio. It suddenly flows into my mind, so I write everything down not to forget. If there is a song sounds good to me, I will try to reproduce it. I put up all the parts with TDM, so that’s why I don’t use the guitar to write my songs. Because I have the music all in my mind, I generally don’t start to write the phrases on a guitar. At the stage of arrangement, I evaluate which songs are good or bad, and then I arrange songs by a guitar. For a first time listener of your music, what would you tell that person about yourself? NW: The album is packed with all my thoughts, therefore I want the listeners to freely think and feel my music. If it’s good or bad, it has to be decided by the listeners themselves. If they are interested in my music and ask me any question, I will be happy to answer as much as I could. Maybe I could talk about the concept of DESTINIA ‘Classic Modern’ all night long. At first, I would say to the listeners that thank you for listening to my music, and if they feel sympathy for my music, I would say I will write songs to you I love. Could you give me a rundown of your guitar rig both for studio and live performances? NW: The guitar mainly used for the studio recording was the custom painted Kramer Pacer, but in some songs, I also used the Dean V, which is my main guitar. I think for the amps for this recording I use a mix of EVH III and Engl at Fredrik Nordström studio in Sweden. I had been using Ecstasy B101 by Bogner amp, but recently I am using the Kemper controlled with Helix by Line6. With this, I can use the advantages of both Kemper and Helix, and it is trouble free because it has a backup system integrated. About the pedal, I am using Dimebag Darrell signature wah. The Cabinet is a Bogner 414. Any plans to tour the US? NW: I have not yet found the agent for the US tour, but if possible I would like to perform with the full line up of “METAL SOULS”. The fact is that Marco, Tommy, and Ronnie are all involved in a year-long tour, so it may be difficult to coordinate our schedules. I often go to the US and I have many musicians who support me, so I think there is a chance to make it happen. Everyone, I definitely want you to come! Speaking of the musical part, I was influenced by the music style of 80’s-90’s metal. DESTINIA’s concept is ‘Classic Modern’, which is also my concept. The songs of DESTINIA are often strongly influenced by DIO’s music style. As a guitarist, at first, I’ve personally been influenced a lot by Ritchie Blackmore and after from Michael Schenker. Not only his guitar phrases and melodies but also his composition are really amazing. His guitar sound is like reflected by his life, and it’s like himself and his guitar are unified. As I am working as a graphic designer for Michael’s merchandising, I had a chance to see him playing closely and I could feel it. Also, Randy Rhoads and Uli Roth had an important role for me. I do not play Les Paul, but the sound of John Sykes is the best. Technique is important, but I want to be a rock star that looks cool at first glance. As for now, I will tour Japan with a Japanese musician as a supporter musician. After that, I will go to Las Vegas to finish Paul Shortino’s new album. I think it’s going to turn into an interesting album! Prepro has been also advancing a lot! Anyway, I’d like to play in front of all my American Fans! Keep following on DESTINIA and Keep it metal!